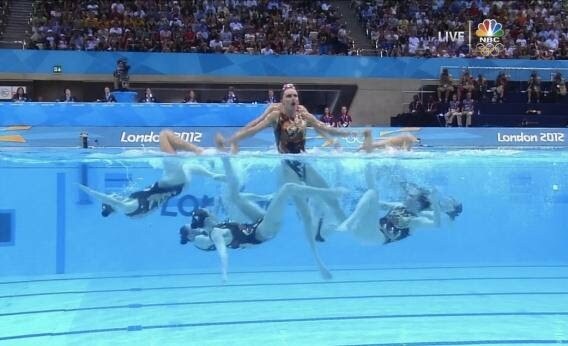 Synchronized swimming is a graceful sport. Gorgeous women. Beautiful choreography. Precise movements. And it all comes together wonderfully. But the technology required to show this is way more advanced than you think as normal cameras won't cut it. Thus, here comes the Twinscam. The Twinscam shows synchronized swimming as it's never been seen before. It was invented by the Japanese broadcaster NHK in 2010. It’s a solution to a common problem in the Olympic water events: Because of the way light refracts and reflects differently above and below water, we’ve only been able to see shots that show one point of view at a time. The heavy image processing needed for a camera that could do both has also made live broadcasting impossible until very recently. The Twinscam works by tricking the viewer using two cameras, one above the water and one below. The camera then combines the feeds from each to make it look like one shot. As the swimmers approach technical perfection, the Twinscam’s separate lenses do their own synchronized dance, zooming and sweeping right along with them and sending a combined feed to an international audience. The result was stunning; Instead of switching back and forth, we saw what these athletes were doing below the water to support and create the show above. Thus as usual Sports as driven technological innovation once again. The way the Olympics did with Colour Television, High Definition, and 3-D. And what can we say. Long may it continue.